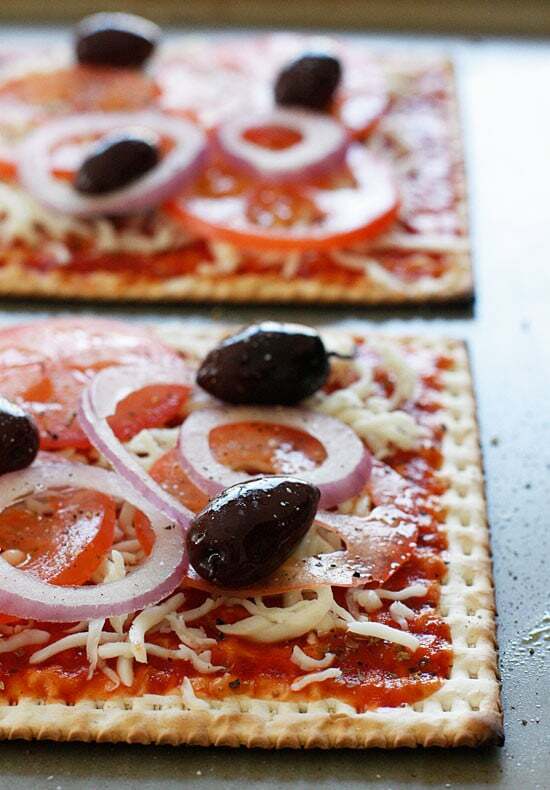 A matzo cracker makes a great base for a pizza that kids and adults will love for Passover! Top it with your favorite vegetables and cheese and you have yourself a quick meal. I love making pizza’s out of just about anything, my daughter will eat just about anything if I top it with sauce and cheese (yup, even zucchini pizza). 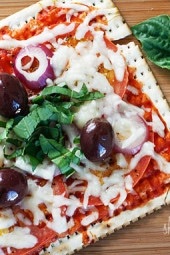 A while back I posted a recipe for my favorite quick Lavash Pizza and someone commented how they do the same with Matzo so when I got requests for Passover recipes, this was the first thing that came to mind. I personally love red onions and olives on my pizza, but you could slices of bell pepper, baby spinach, mushrooms… you name it! For my daughter I kept it basic, sauce and cheese and she loved it! 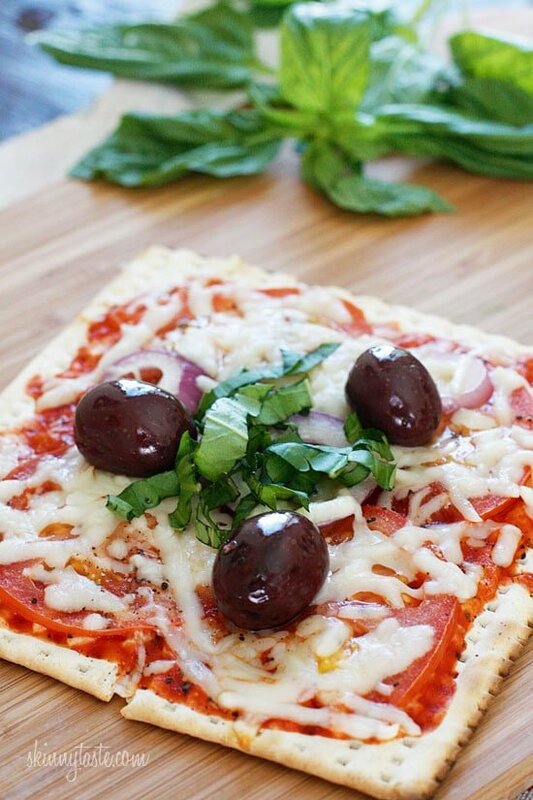 A matzo cracker makes a great base for a pizza that kids and adults will love! Top it with your favorite vegetables and cheese and you have yourself a quick meal. Place a rack on a baking sheet. Spread 1 1/2 tablespoons of crushed tomatoes on each matzo. Don’t put too much or it will get soggy. Sprinkle with oregano then top with tomatoes and onions. Top with 1/4 cup of cheese on each one, olives and bake in the oven until the cheese melts, about 5-6 minutes. Pingback: 6 clever ways to pack pizza for school lunch. Hold the hot pockets. 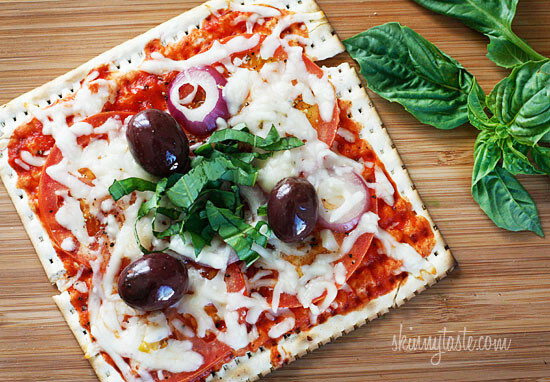 Looks like a great way to eat matzo! Found it on pinterest. Got a question for you… I'd just read post about pinning responsibly so this is fresh. I wondered if the pin I saw this on is what they were referring to since he had the full recipe in the pin. Here's the link… http://www.pinterest.com/pin/144607838005369307/. Just thought you'd want to know. If this is legit, just delete this. Thanks! The rules for keeping kosher are very complex and go way beyond not mixing meat and dairy. At passover time those rules are even more stringent. Erica – what brand of reduced fat k-p cheese do you buy please? I usually use pita's for pizza …can't wait to try this!! Thanks!!! I love matzo! I too would like to see some skinny macaroons 😉 hint hint! One quick question about this recipe – what does it mean to put a rack on the baking sheet? Not sure if I'm reading that right. 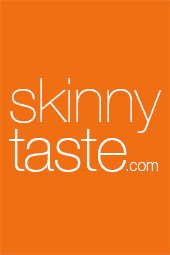 Love the site and the recipes btw! If you have a rack instead of putting it directly on the baking sheet it will be crispier, but if not, no worries. This looks wonderful. I have been wanting to make new homemade pizzas. Thanks for sharing! This looks fantastic! I've been really into pita pizzas lately and just blogged about mine last week. I can't wait to try motzo pizza now! made this last night with goat cheese and thinly sliced baby heirloom tomatoes then drizzled a mixture of olive oil, balsamic vinegar, and fresh chopped garlic after it was baked. the cheese soaked up the oil-vinegar mixture so the cracker was still a super crispy crust! What a creative idea for a pizza snack! Love your skinny take on everyone's favorite. This is genius! Look tasty! I am unsure what a matzo cracker is. I'll have to ggole it! 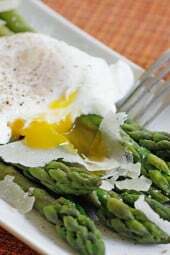 My husband and step-daughter would love this recipe!! Thank you so much for this recipe! More, please 🙂 I have never baked matza pizza in the oven – only used the microwave, which makes it sort of soggy. I appreciate you taking the guess work out of what temperature and for how long to bake. I will probably use whole wheat or onion matza. No, of course Sargento brand cheese is not strictly Kosher for Pesach. But there are other brands of cheese available for purchase that are, so simply substitute with one of those. I don't think it's realistic to expect a strictly Kosher recipe from this site, or from any site that is not tailored to a specific community. Of course not, however one would think a mention of this wouldn't be offensive and perhaps educational. Those looking for passover recipes that are strictly kosher would be looking elsewhere. No ill will intended, only a desire to share knowledge. I though no dairy if you are eating meat. Gina, That is one part when you keep Kosher…When you keep Kosher for Passover, all foods need to be marked Kosher for Passover on the label. The kosher supermarket by me sells reduced fat K-P cheese. You just have to look for it. Sorry for the delayed response…I buy either Miller's or Haolam. Whatever is usually on sale. thanks so much for including this passover food idea. It gets so boring trying to think of new and creative ways to get through the holiday. If there were more recipes for passover it would be appreciated so much!!!!!!!!!!!!!!!!!!!!!!!!!! Definitely the only good way to eat matzo! I second the skinny macaroons comment… yum yum coconut! thanks so much for thinking of the passover ppl! Love this idea!! I've never had a matzo cracker!! Yum- simple and easy and full of flavor too! Omg this is awesome! I am so happy you did a recipe like this!! Yes, please more Passover recipes! Does anyone know how to make their own matzo? I love using Matzo for pizza crust! I also use it for tuna melts with tomatoes. SO GOOD. 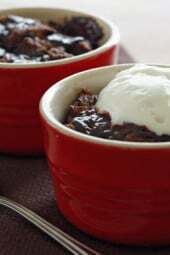 Love this recipe…keep the Passover ideas coming! Love this idea – a crispy, thin crust is essential for the perfect pizza (in my opinion)!